Content marketing is hard. Shareaholic makes it easy. Content marketing involves the creation of valuable, relevant content with the goal of attracting a target audience and ultimately converting that interest into sales. The key words in this extremely simplified overview are valuable and relevant. Content marketing differs from traditional marketing techniques in that it should attract rather than intrude. In order to get people to come to you, your content has to be useful and engaging enough to hook and retain interest. This can be tricky enough in a monolingual campaign in a language and culture you are familiar with. If you decide to take your content global, however, there are even more things to consider. Even if you consider your product or brand to have true global appeal, it is usually advisable to concentrate on one or two new markets at a time. Google Analytics is a simple way to check where your existing visitors are coming from. This can give you a starting point but, as with any venture that requires an outlay of time and resources, thorough market research is essential in order to assess whether your message and product has sufficient demand. English has always been the single most widely used language online and it can be tempting to think that a single English language website and content stream will hook in enough interest. 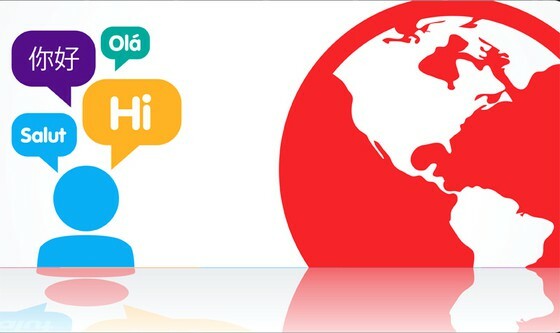 But around three-quarters of internet users do not speak English. And there is plenty of evidence that even users who speak it as a second language prefer to access sites in their native tongue. According to a new survey by Common Sense Advisory, 55% of respondents from non-Anglophone countries said they only buy products from websites that provide them with information in their own language. For people with a limited knowledge of the English language, this rose as high as 80%. 56% of people across the 10-country sample either spend more time on sites in their own language than they do in English, or avoid English-language sites altogether. Translating existing content or creating generic content that can easily be translated into several different languages is a relatively simple process, especially if you work in conjunction with native speaking translators. Creating specially tailored content can be even more effective. Coca Cola’s ground breaking Chok! campaign used local slang and tapped into a passion for fun interactive apps, becoming a huge hit with teens in Hong Kong. The campaign used a combination of TV, cinema, YouTube, micro-blogging site SinaWeibo (the Chinese equivalent of Twitter) and outdoor screens for maximum impact. Of course, not every company has the resources to carry out an integrated campaign on such a scale, but it does illustrate the way that locally targeted content can really have an effect. Systems such as Drupal and WordPress all support multiple languages and can be used to create or adapt content to suit your target market. In Drupal, for example, enabling the Locale core module allows you to present the interface in another language. This can be great if you have native speakers managing your content but you can also present translated content without having to alter the interface at all. Entity Translation is a feature that allows each piece of content to be stored on a single node and each field on that node can have multiple copies, in different languages. Other tools such as translation memories can also be useful for translating existing content. These store previous translations across particular language pairings and can be used to search for sections of content that have already been translated. These can then be used in the new content, saving on time and costs and helping to retain a sense of identity across your translated content. Each piece of carefully constructed, translated or adapted content needs to be given as much exposure as possible. This means linking your localized websites, blogs and social media profiles, and planning multi-channel campaigns. All the big names in social media have global audiences. Facebook is available in over 70 languages, Twitter has become a true global phenomenon and around two thirds of LinkedIn’s 300 million users live outside the US. In some markets however, local competitors might provide a better option. According to Alexa rankings, VK (formerly VKontakte) is the most popular social media website in Russia and is also important in many other eastern European markets. Orkut is huge in India and Brazil and China – where Facebook and Twitter remain officially banned – presents its own distinct challenges. Coke, Nike and Calvin Klein all engage with Chinese consumers via profiles on the Facebook-style RenRen while Pizza Hut successfully uses SinaWeibo to link to special offers in local branches of its restaurants. Content marketing across multiple languages can throw up a lot of different challenges. As the web becomes ever more diverse (and hopefully your customer base with it), it can offer an invaluable way to reach out across linguistic and cultural barriers. About the author: Christian Arno is the Managing Director of Lingo24, a translation agency. Follow Lingo24 on Twitter. Want to write for Shareaholic? Contact us here. Shareaholic is hiring. See our job openings.